I was privileged to be the speaker for GSQA's quarterly meeting in New Orleans April 30. The meeting was hosted by Mes Amis Quilt Shop and The Stitchy Fingers and Cotton Pickin' Quilt Guilds. These groups furnished delicious breakfast snacks as we arrived, as well as a huge spread for lunch of meats, sandwiches, salads, and even Cajun Gumbo. 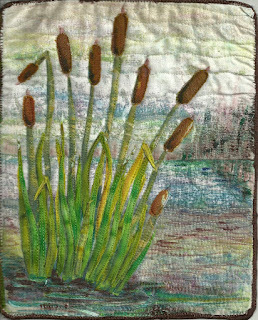 We had equipment failure which prevented the PowerPoint pictures, but I had lots of real quilts and fiber art to show. I told the group that I owed a debt of gratitude to GSQA for hossting the many educational seminars and bringing in great national teachers I had learned from over the years. It was after GSQA's first seminar in 1984 at USM Long Beach that four of us in Hattiesburg formed Pine Belt Quilters. . . and the rest is history. 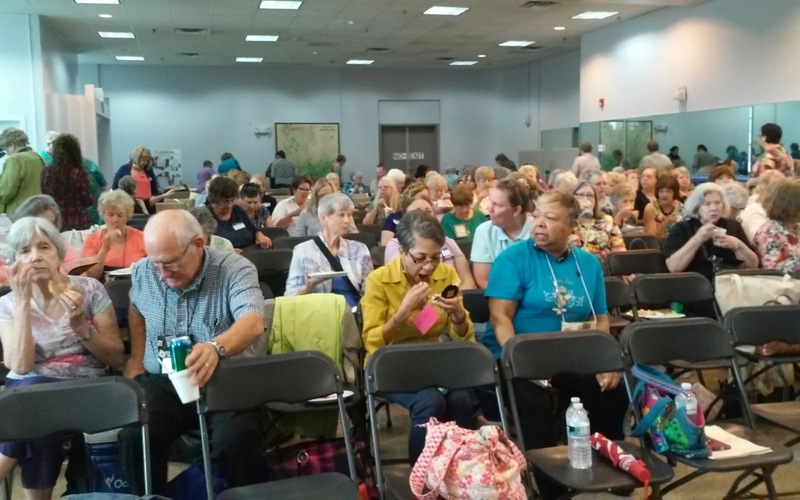 In spite of thunderstorms moving across the area, there were about 165 quilters present. 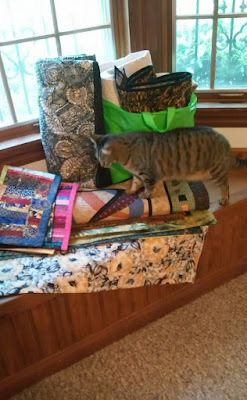 In addition to the pieces I brought with me to show, I told them about my 2013 trip to China as a guest of the U.S. Embassy in Beijing, South Arts (Atlanta), and Arts Midwest (Minneapolis) for the opening of The Sum of Many Parts: 25 Quiltmakers in 21st Century America. The exhibit visited museums in six cities, and I attended and gave talks in Dalian and Beijing. My quilt, "Rise and Shine, Inner City," was one of the 25 pieces in the exhibit and was shown on the cover of the catalog. This large poster in front of the museum is a replica of the catalog. Mid-America Arts Alliance picked up about half the exhibit and toured locations in the U.S. following the China exhibits. My quilt is scheduled to come home this summer. Among my favorite pictures are the ones of the crowds getting up close to see the quilts after I spoke. I had an interpreter with me at all times, but many of the students asked questions in English and understood much on their own. I donated one of my pieces, "Butterfly Crossing," to the Dalian museum and enjoy thinking that the people will enjoy seeing it and remembering the exhibit. Another page arrived--my fourth one--from Sandy Donabed. Sandy has written on the quilted back "remember, on the darkest night you can see the stars. 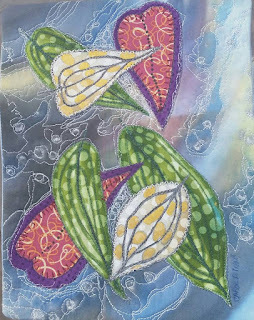 (4-color monoprint, fabric collage, paint and stitch)" This piece is amazing in its beauty and the variety of techniques she used. Again--each page is different and I'm sure represents the maker and her desire to surprise the recipient with a real treasure! Click to enlarge. I have made four and received four, with five to go. This is fun. 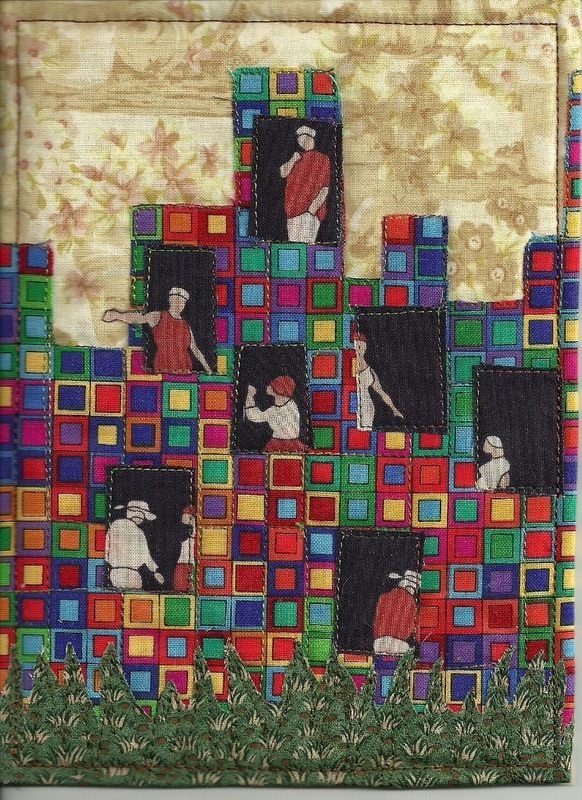 I received the third page for my Artist’s Altered Book Collaboration, and is it a beauty! Well, another beauty! My theme is “Leaves, Trees, Rocks, Water, Anything Nature Related,” which is pretty broad, just like the pages I’m receiving. 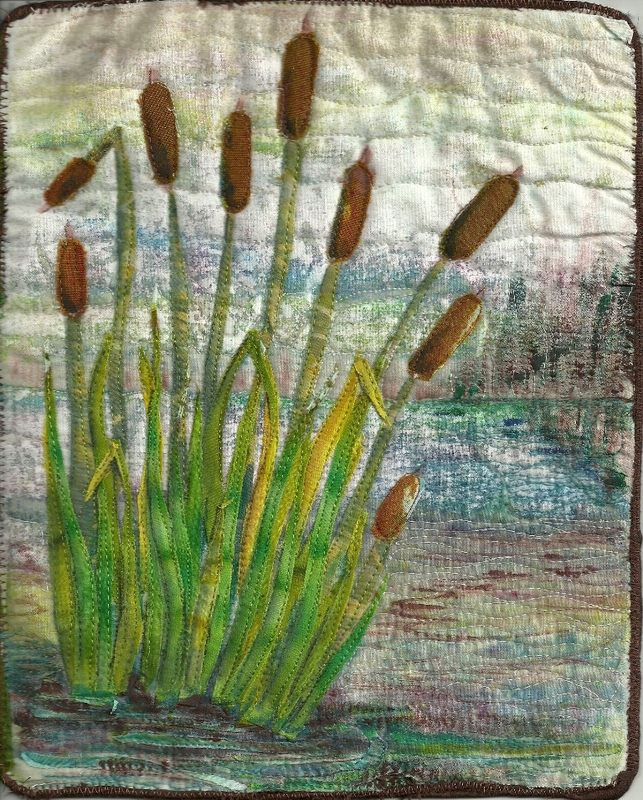 Gabriele DiTota made this page, which she titled “Our Wetlands,” with such realistic depictions of muddy bank, cattails, water, hillside, and sky, that it evoked such comments as “I can almost hear ducks calling overhead,” and “I can imagine soft whimper of a baby from a basket.” What a rich image and feeling it evokes. I have a huge rosemary bush at the edge of a flowerbed by my driveway. Occasionally I trim it and deliver cuttings to the chefs at two of my favorite restaurants (Patio 44 and Tabella’s). But the bush is still shielding the flowerbed from sunlight so I did more severe trimming. 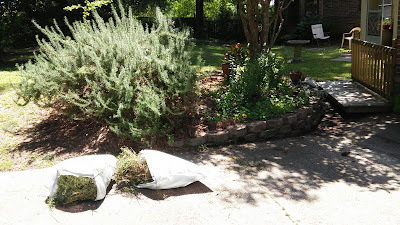 Here is what it looks like after stuffing two bags full of cuttings. I wish it would root so I could share the growing plant, but it seems resistant to propagating. 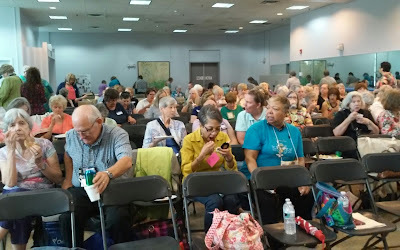 I’m looking forward to presenting the program in New Orleans April 30 for the Gulf States Quilting Association quarterly meeting. My son drove here from Dallas last week and did lots of fix-up projects. The weather was perfect for replacing the outdoor security lights and planting caladium bulbs. 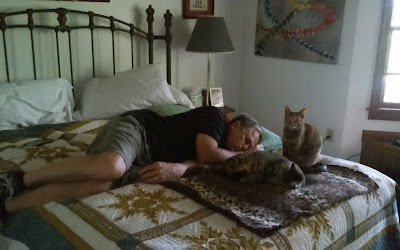 He enjoyed my cats Rah-Rah and Elizabeth, and the girls enjoyed him; Tarbaby took several days to warm up. After three days of non-stop activity, a little relaxation with the girls was in order. I have received two pages for my book. Carol Jones Frank sent this one, describing it as fantasy leaves floating on water. It has silver stitching simulating bubbles and froth on the water--beautiful! 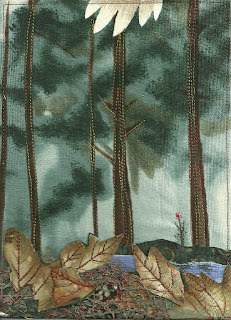 Carol says often her art features the idea of floating: "that of stopping time, being ethereal or otherworldly." Nanette Zeller's page came next. 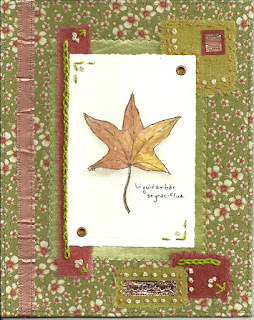 She watercolored a sweet gum leaf and added some copper tape and hand embroidery. 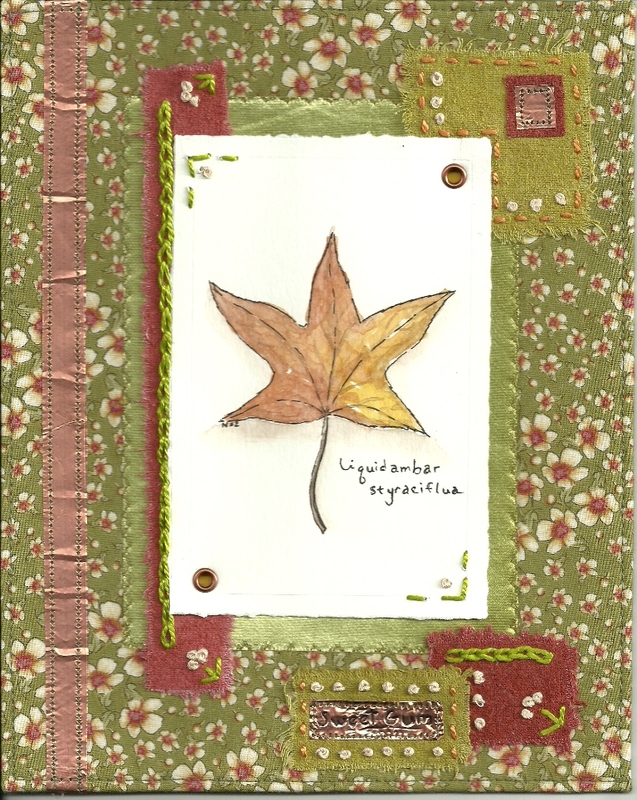 Sweet gum trees are some of my favorites because of their wonderfully colored leaves in the fall, running from bright yellow through orange and bronze all the way to deep purple. The seed pods are treacherous to step on but have a special beauty in their intricate design. I was interested to learn that the sweet gum is a host species for luna months. Carol Suto's theme is "Habitat." I chose to feature apartment living for her page. Thinking of the crowded conditions many people live in makes me even more thankful for my home and yard. 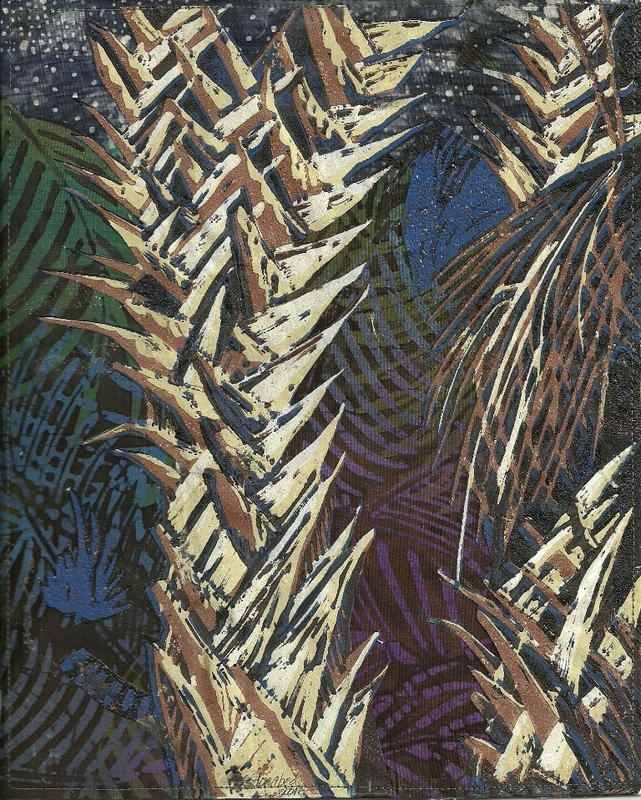 These pages can be made using any technique or even a combination, so it is interesting and challenging to decide what to make and what methods to use. We are supposed to send and receive one page a month, but most of us are enjoying the process and tend to get ahead of schedule. No problem with that.